The main tools of the Jiu-Jitsu fighter are knowledge of the opponent’s weakest points and leverage. Because of this BJJ exploits anatomical weakness to gain maximum effectiveness with minimum effort. It is an art based on a smaller weaker person fighting a big, faster and stronger opponent. BJJ does not include the use of striking or bludgeoning of the opponent. BJJ is an art, a sport and a way of life. BJJ is primarily focused with combat taking place on the ground. BJJ emphasizes strategy, leverage, technique and precise body positioning to control dominate and submit the opponent. Brazilian Jiu-Jitsu involves ground-fighting techniques and submission holds composed mainly of joint-locks & chokeholds. Brazilian Jiu Jitsu is divided by levels, each level is represented with a different coloured belt. 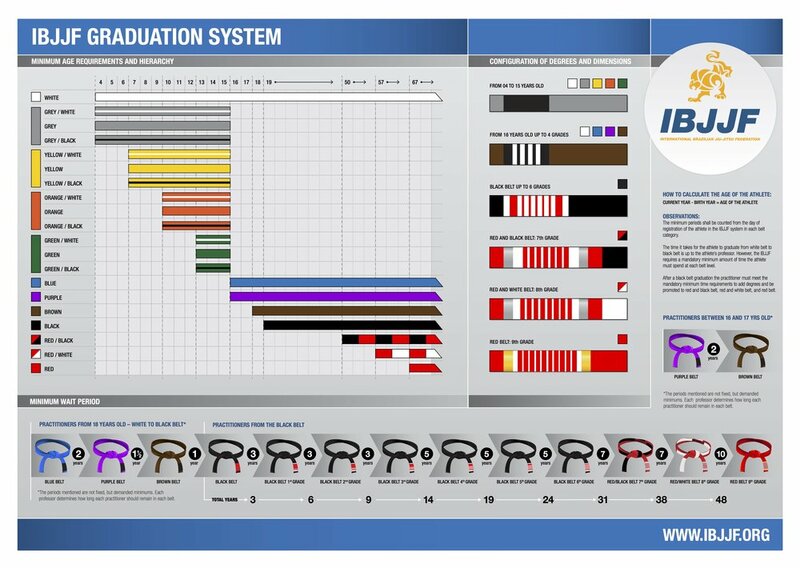 The picture below explains the official IBJJF Graduation System, minimum age requirements and hierarchy.